Today’s weather was iffy. Rain was predicted but we thought we would be able to get in a half day of work at Richard’s house and then we might have to move to inside work. It was very cloudy to start the day but then we started having some occasional sunshine. When the sun was out it was hot and humid! As we were finishing lunch it started raining so we all jumped up and started picking up all the tools to keep them dry and covering all our lumber for the same reason. By the time we got everything covered, it had just about stopped raining. An hour or so later we had another brief shower. So, we are grateful for essentially an entire day of work. Now tomorrow may be a different story. 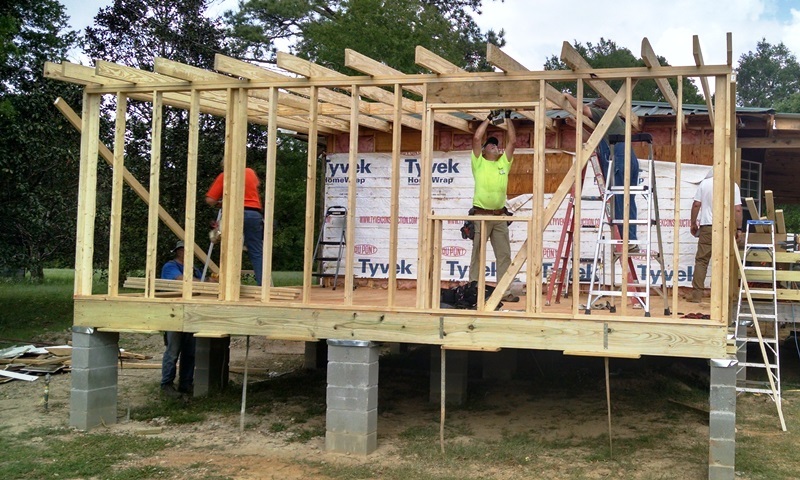 Today, we really wanted to get the rafters all hung so we had a team of folks working on that project. 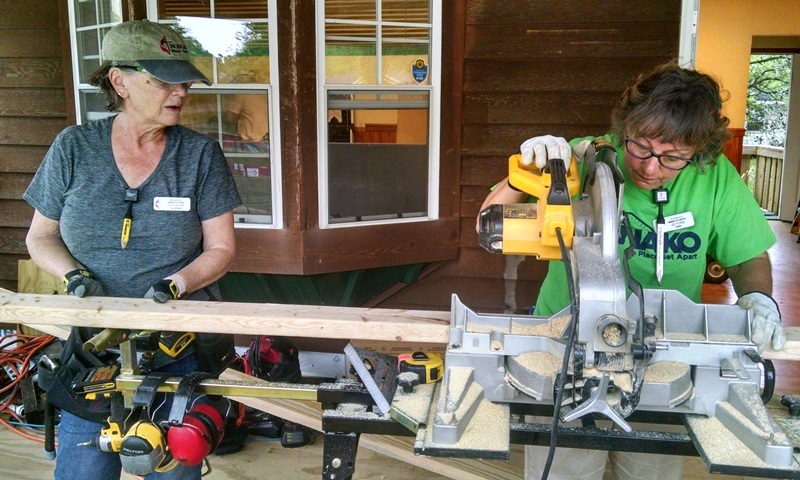 Mark and Dave were working on the framing, while Jo and Rita ran the saw. 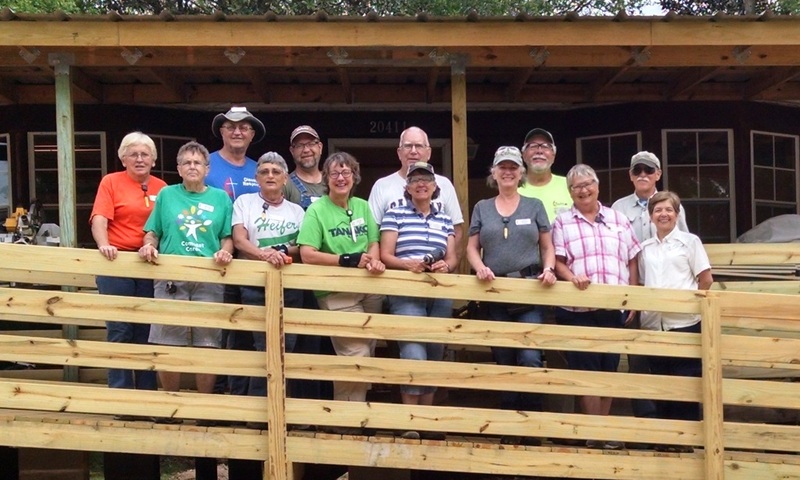 Throughout the day others were on the deck and helping with the framing including Stel, Gary, Avis, Barrie, Jodi, Suzanne and Lee Ann. At the end of the day all the rafters were up. YEA. Additionally the south wall was up and the north wall has been laid out. Our siding painters, Lee Anne and Suzanne, are now siding installers. They are doing a great job. 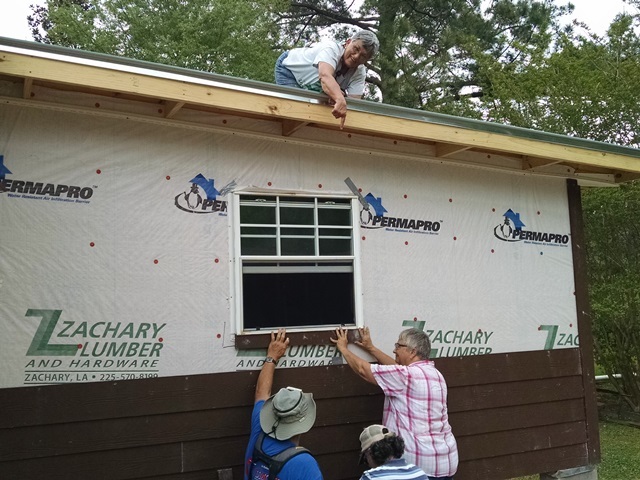 Others working on siding included Avis, Jodi, Gary, and probably some others we failed to mention. The siding is going to look very good when we get a second coat of paint on it. Max and Avis worked on the roofing for bedroom one and are close to having that completed. We are still waiting on screws that are on order. Anne put up a little insulation today but primarily tried to keep everyone else with needed supplies and filled in where ever she was needed. A lot was accomplished. We were pleased. Tomorrow will totally depend on the weather. Sure hope we get to go back to Richard’s.